Wix vs WordPress: Which Platform is Better for You? There are a lot of platforms you can use to create a website. However, we can divide most of them into two categories: website builders and Content Management Systems (CMSs). Wix is an excellent example of the former, while WordPress represents the latter. Afterward, we’ll sum up the advantages of using each platform, so you have all the details you need to make an informed decision. Let’s talk WordPress vs Wix! Before we go any further, it’s important to understand the fundamental differences between Wix and WordPress. As we mentioned earlier, although they both enable you to build websites, they aren’t the same kind of platform. 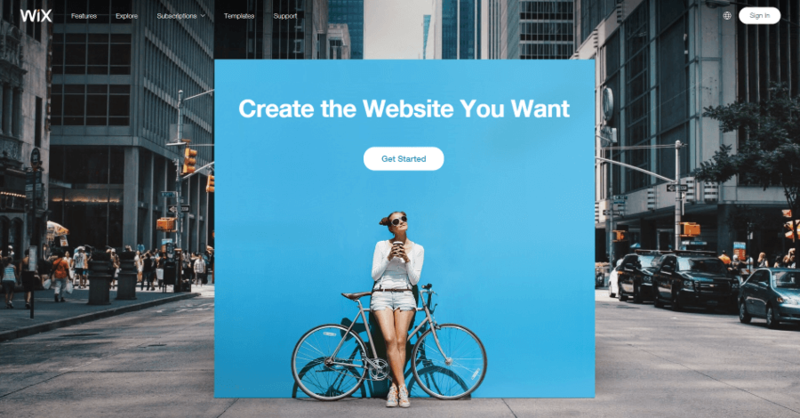 Over the past years, these types of platforms have skyrocketed in popularity, because they enable you to create websites without a background in development. There are limitations to what you can accomplish using a website builder, however. Although WordPress was once primarily a blogging platform, it’s long outgrown that classification. These days, WordPress powers over 30% of the entire web and can be used to create nearly any type of website. Over the next few sections, we’ll break down why the platform is so popular, and help you decide whether to use WordPress vs Wix. However, there’s one crucial distinction you need to understand before we move forward. Perhaps the biggest difference between a website builder and a CMS is that the latter is self-hosted. 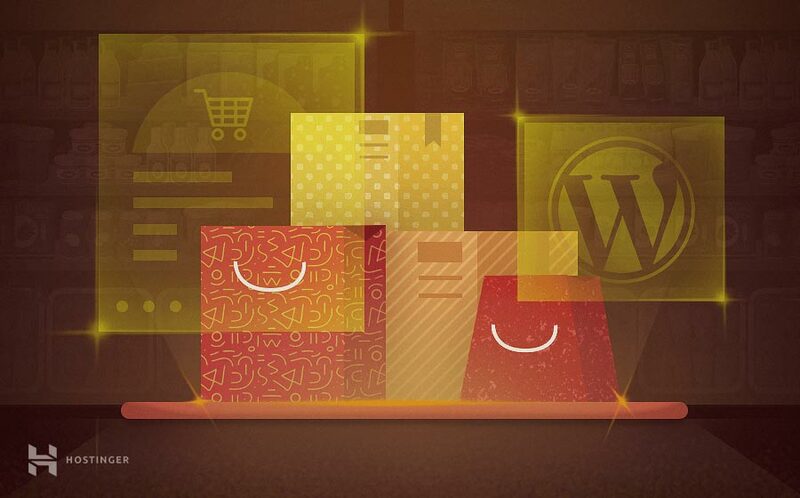 This means that with Wix, your site will automatically be stored and displayed by the platform’s own servers. With WordPress, on the other hand, you’ll need to find your own web host and purchase a plan in order to make your site live. This takes a little more work, but also gives you a lot more control over your site’s performance, security, and optimization. Plus, you can find WordPress hosting plans for a very low monthly price. There is a version of the platform that’s hosted for you, called WordPress.com (as opposed to WordPress.org). It’s a lot like Wix and has the same kinds of limitations. In this review, we’ll be focusing on the self-hosted WordPress.org version. Now that we’ve introduced our two contenders and their major differences, let’s see how Wix vs WordPress stack up in a direct comparison. First up, let’s talk about ease of use. Our benchmark here is whether each platform is accessible to someone who is completely new to it. Ideally, you should be able to pick up either Wix or WordPress and start using it effectively right away, without devoting weeks or months of study to it. There are a few features here that might be somewhat advanced for a beginner to web development. For example, you’ll probably need to look through the platform’s documentation if you want to use its Customer Relationship Management (CRM) options, as well as its marketing tools. Ultimately, Wix offers the kind of experience where you can start using the platform and set up a great-looking homepage for your website in a couple of hours (or less). That’s useful, particularly if you’ve never created a site before. Having a lot of options to customize your website isn’t a bad thing, to be sure. However, it does mean that WordPress has a somewhat steeper learning curve than Wix right out of the box. However, editing those pages and making them look exactly as you want them to is a bit more involved. To do that, you’ll need to find a WordPress theme that fits your style, and learn how to customize it. Keep in mind that a lot of WordPress themes these days include their own page-builder tools, and there are also plugins that can add this functionality. In other words, if you want an experience that’s more like Wix while still using WordPress, it’s possible to get it quite easily. Ultimately, Wix is easier to use out of the box than WordPress. Keep in mind that once you learn the ropes, there’s a lot more you can do with WordPress than with Wix. Even so, round one of the WordPress vs Wix comparison goes to Wix. For this next section, we’ll focus on the options both platforms provide to help you manage your website. By ‘management’, we’re referring to a whole host of diverse but vital actions, such as updating it, performing troubleshooting, cleaning out old posts, and more. 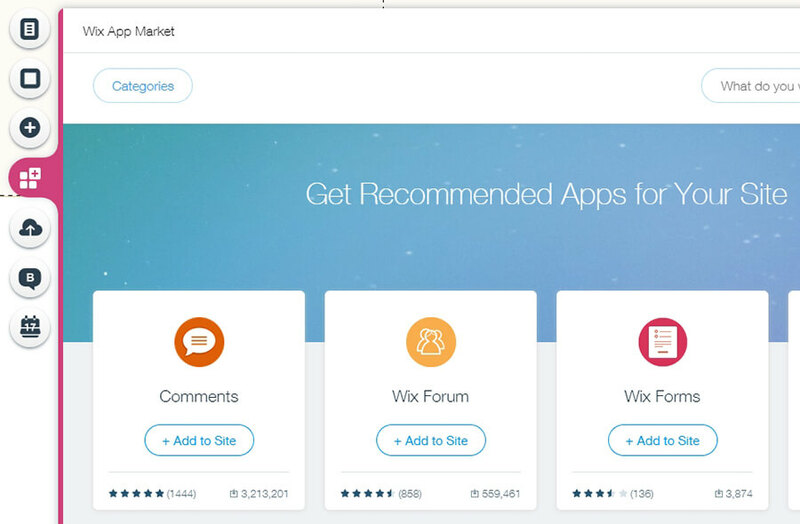 First, let’s take a look at Wix. When it comes to site management, Wix’s pitch is that it keeps things simple, so you don’t have to worry about the little details. For example, you don’t need to concern yourself with updating the platform, since it does that by itself in the background. 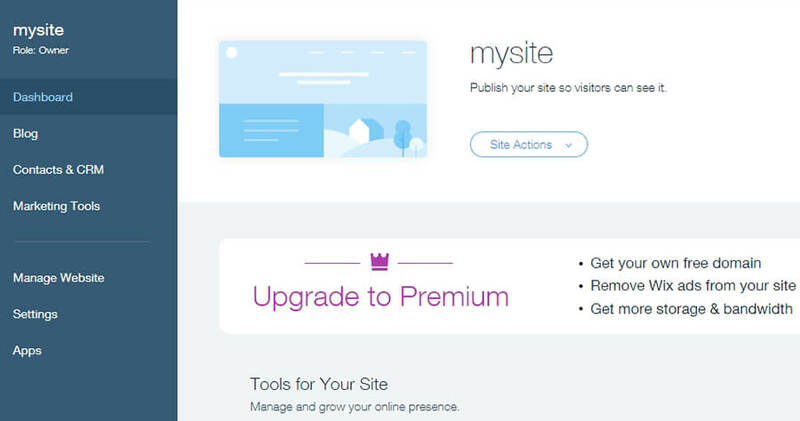 Likewise, if you wish to access to analytics data (which is key for growing your site), you’ll need to upgrade to a Wix premium plan. That’s not necessarily a bad thing if you’re committed to the platform, but it will cost you more in the long run than using WordPress. Overall, Wix provides you with a more straightforward experience when it comes to managing your website. However, WordPress offers a lot more depth and options, which is critical for running a website successfully. For this round of WordPress vs Wix, therefore, the former is the winner. It’s a bit hard to compare WordPress vs Wix when it comes to performance, due to the different way each platform is hosted. However, let’s look at the key differences. As we mentioned earlier, Wix is a hosted platform. That essentially means you’re paying for access to a website builder and hosting, all within one package. Wix doesn’t enable you to make customizations that can alter the fundamental performance of your website. Instead, the platform’s team takes care of making sure all sites are loading as fast as possible, at least on paper. During our tests, we found that Wix pages do tend to load rather quickly. Wix provides you with solid loading times, partly thanks to automatic image optimization and the use of a Content Delivery Network (CDN). To put it another way, Wix can be a good option if you’re the kind of person who doesn’t want to worry about having to fine-tune your site’s performance. The downside is that you have no control over how well your site runs, and you have few options when it comes to seeking out better options. With WordPress, you can use whatever hosting plan you like. This enables you to shop around for the best fit, and decide exactly what kind of performance and how many resources your site needs. Hostinger, for example, offers excellent performance, and our shared hosting packages are more accessible than Wix’s premium plans. As you can see, there’s a recurring theme throughout this Wix vs WordPress comparison. If you’re willing to put in a little extra work, WordPress often takes the edge over Wix. When it comes to performance, WordPress enables you to ensure that your site is always running in top form. Ideally, whichever platform you choose to use should be unbreachable. No one should be able to access your accounts without permission, or get their hands on sensitive data. However, the sad truth is that there’s no such thing as a 100% secure platform. The best you can do is limit your risks as much as possible, by choosing a platform that has a strong reputation when it comes to security. On top of that, there are also ways to increase your website’s security manually (depending on which software you use). Users can’t edit the underlying software’s core functionality, so there are fewer security vulnerabilities. These platforms are self-updating, so outdated software isn’t a concern. That is not to say that Wix is perfect from a security standpoint, however. In the past, it’s suffered some major security breaches. However, this isn’t a common occurrence at all, and Wix definitely scores well in this area. With WordPress, the situation is a bit more complex. Since the platform powers such a large percentage of the web, it’s one of the biggest targets for online attackers. After all, finding a single small vulnerability can often be enough to target millions of sites, which is a strong incentive. That being said, WordPress itself is very secure. If you follow a few smart practices, such as updating your site, plugins, and themes whenever possible, you’re already well ahead of the pack. WordPress and its community release frequent patches designed to protect your site from the latest threats. Plus, with WordPress, you also get to play around with advanced security plugins and settings. These enable you to lock down your website further. In other words, just as with performance, you can customize your site to make it as unfriendly as possible to hackers, spammers, and so on. When it comes to security, we have to declare Wix vs WordPress a tie. Both offer secure experiences out of the box, and Wix has an edge if you don’t want to deal with security yourself. However, WordPress sites have the potential to be far more secure, as long as you’re willing to put in some research and effort. Finally, whichever platform you choose should provide you with enough options to build any type of website you want. The more you can customize your website, the more types of projects you’ll be able to tackle, which is essential. Even if you’re only planning to build a simple website, we recommend that you keep your options open. At some point, your website might grow to the point where you feel to need to access more advanced features. You may even want to expand what it does, such as adding a storefront to your blog or a portfolio to your business site. Likewise, the platform provides you with a lot of styling options, including themes and the tools you’ll need to edit your site’s look and layout. The best thing is that a lot of the best WordPress plugins are free, which means you can set up advanced functionality without having to strain your budget. It’s a common aphorism that whatever you want to add to your site, there’s a plugin out there to help you do it. Finally, it’s also worth remembering that WordPress is an open-source platform. This means that if you’re more technically inclined, you can edit any aspect of its code, and alter its functionality and look by hand. If you have any experience with web development or you’re not scared to follow online guides, you can create WordPress websites with features Wix can’t hope to match. For those reasons, we have to give a clear win to WordPress when it comes to customizability. Before we wrap up, however, let’s take a minute to sum up what we’ve learned so far by comparing WordPress vs Wix. It’s designed to help you create attractive websites with an intuitive visual builder. You get solid security and performance out of the box. The platform offers a lot of customization options and third-party service integrations. When it comes to WordPress vs Wix, we recommend that you use the latter if you’re looking for a streamlined website creation and management process. If you’re new to building sites and you have a simple project in mind, Wix can be a strong option. It’s relatively easy for a beginner to pick up, but offers enough options for experienced developers to sink their teeth into as well. The platform comes with an almost unmatched level of customizability, thanks to its open-source nature and a vast collection of plugins and themes. You get a lot of options to help you manage large libraries of content. You’ll have almost total control over your site’s security, performance, and hosting. Comparing WordPress vs Wix is a challenge because the platforms are so different at a fundamental level. However, by now, you should have all the information you need to choose well. It’s no secret that WordPress can take a little longer to get started with. However, it offers a much more in-depth experience, while still remaining beginner-friendly. If you don’t mind doing a bit of research and some hands-on learning, you’re often better off choosing WordPress, since it will enable you to create almost any type of site you want. Creating a website takes work, but if you’re using the right platform, the process becomes much easier than you might expect. 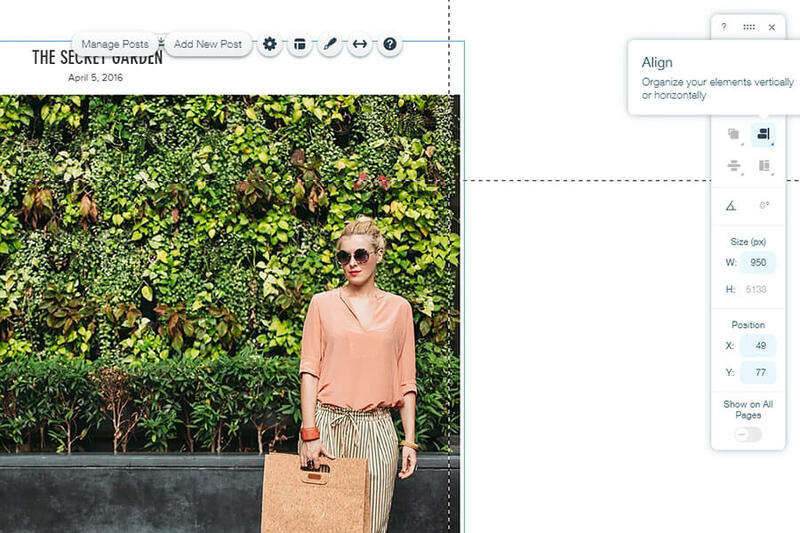 Wix, for example, enables you to create simple websites easily thanks to its intuitive page builder. However, the platform stumbles when it comes to more advanced projects, which is why we’re more inclined to recommend WordPress. What are your thoughts on the Wix vs WordPress debate? Share them with us in the comments section below!